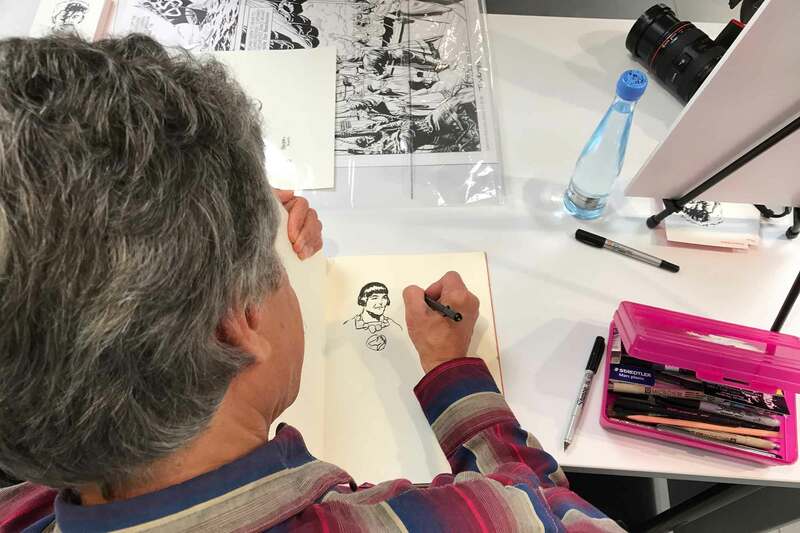 Thomas Yeates has drawn comics for over 25 years. He is considered by many to be an astute master of his trade. Thomas Yeates was born on January 19, 1955 in Sacramento, California. He grew up with three older sisters and his mother and father. He made his first serious efforts in drawing as a six year old kid. From this time on, Thomas said, he never stopped drawing. His early inspirations were, of course, Tarzan and Disney’s Peter Pan. Tarzan was one of Tom’s childhood heroes and until today he is Tom’s favorite character. He once stated in an interview that he felt he was most alive when drawing Tarzan. Thomas is basically self-taught. His art training began in high school and continued at Utah State University and Sacramento State. Subsequently, he was a member of the first class at Joe Kubert’s School, a trade program for aspiring comic artists. Strongly influenced in his craft by old-guard illustrators like Hal Foster, N. C. Wyeth, Al Williamson and Wallace Wood, Yeates favorite settings to draw are the outdoors, and exotic locales. He particularly enjoys drawing pictures that reflect his feelings about justice and injustice, beauty, mystery, and adventure. Yeates first professional work was for DC comics in 1978, a story featured in Sgt. Rock titled "Preacher". He worked for DC Comics on numerous series, including Warlord, Mystery in Space and Swamp Thing. From 1984 to 1985, Thomas Yeates was the artist for Timespirits from Marvel/Epic. He worked for Eclipse Comics on titles such as Airboy, Scout, Lugar, the political documentary Brought to Light, and Aztec Ace. For Pacific Comics, Yeates did Alien Worlds and Vanguard, and for T.S.R., he illustrated the Dragonlance Saga based on the Dungeons and Dragons game. He went on to illustrate a total of 15 Tarzan comics, many for Dark Horse. ”The Return of Tarzan" featured his adaptation into comics Edgar Rice Burroughs second Tarzan novel. In 2017 Thomas worked hard on a revised Softcover collection of "The Beckoning". He redrew several panels and re-colored almost each page. During the same period, Yeates also illustrated "Dracula vs. Zorro" for Topps comics. This cult favorite was his first teaming with writer Don McGregor. Thomas then returned to DC and illustrated a comic book authored by Rachel Pollack titled "Tomahawk". Set at the beginning of the American Revolution, it traces the awakening of the hero from his own bigotry after being captured by a Native American tribe. In the late 1990s McGregor and Yeates created a highly regarded Zorro newspaper strip. In 2001 Yeates illustrated two Universe X specials for Marvel in collaboration with Alex Ross and John Totleben. They're titled ”Cap" featuring Captain America, and ”Beasts featuring the X-Men. The Paradise X special ”Ragnarok", released in 2003 re-tells the story of the fall of the Norse Gods, featuring Thor, Odin, and Loki. Next Yeates helped Cary Nord pencil issues 3 - 14 of Conan and did an Escapist story for Dark Horse. In 2007 and 2008 he has illustrated seven graphic novels in the graphic myths series for Lerner publishing including King Arthur, Odysseus, Atalanta, King Arthur and Lancelot and Robin Hood. In 2009 Thomas was commissioned to illustrate the "John Carter Of Mars" novel published by Fall River Press in the Library Of Wonder Series. This hardcover book contains the classic tales "The Princess of Mars", "The Gods of Mars" and "The Warlord Of Mars" by Edgar Rice Burroughs. For Dark Horse Comics Tom adapted the first part of the "Outlaw Of Torn"-story by Burroughs. In 2010 Thomas Yeates illustrated two kid’s books by popular writer Anthony Horowitz. Horowitz is the author of the terrific British TV series “Foyle’s War”, the Alex Rider kid’s book series and many other projects. The two books Yeates has illustrated are “Legends Book One Battles & Quests” and “Legends book Two Beasts & Monsters”. In 2012 the collaboration with Horowitz lead to the last two myths and legends books. The illustrations in "Tricks and Transformations" and "The Wrath of the Gods" were penciled by Michael Wm. Kaluta and inked by Thomas Yeates. In 2011 Thomas returned to Tarzan with The Once and Future Tarzan, serialized in Dark Horse Presents #s 8-10. At this time he started working on a western graphic novel based on a Louis L'Amour story (The Law Of The Desert Born) which was released in 2013. The Graphic Novel won a total of 5 Awards and was nominated for the Eisner Award 2014. And he continued work on Groo VS Conan with Sergio Aragones, out in 2014. From April, 1, 2012 Thomas Yeates took the art reins on the greatest adventure strip of all time, “Prince Valiant”. Since then there's a new adventure of the famous Prince every Sunday in Newspapers and Online at comicskingdom.com (by subscribtion).